Here you will find the most advanced performance products for playing Power Wheelchair Soccer! 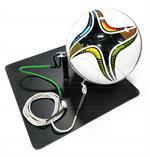 Power Soccer Shop brings your game play to a new level of play! The Strike Force by Power Soccer Shop is the first wheelchair designed Specifically for Power Soccer. Engineered from the ground up, it outperforms every other chair on the market. Fast, Accurate & Reliable Speed Force! These wheels are built to endure the rigors of elite-level competition, while adding some customized style to the Strike Force! 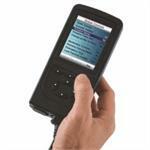 The DTT provides comprehensive, yet simple and intuitive programming for R-Net electronics. Keep your chair cool and at full performance! Cool Force wheelchair fan by Power Soccer Shop. 1in Wheel Spacer for increasing your P200's torque and power for intense close quarters powerchair clashes ! 2in Wheel Spacer for increasing your P200's torque and power for intense close quarters powerchair clashes ! 1.5in Wheel Spacer for increasing your P200's torque and power for intense close quarters powerchair clashes !